« Has it Really Been One Year? Are Your Dreams On Hold? I talk with many people who seem to have put their dreams on ‘hold’ – some have been doing this for such a long time that they have actually forgotten the dream. When we open up to talk, I often hear comments such as: Wow! I actually forgot about that; or, I don’t know where that dream got lost. 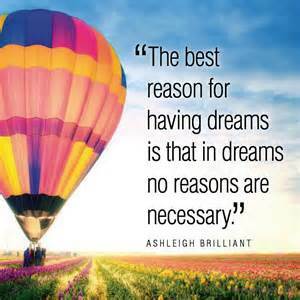 And many times, people will dismiss their dreams because they feel they may not have a good reason to peruse them. The excuses are numerous – as if someone must ‘justify’ a dream. News flash!!!! A dream is simply of vision of what could be! It is there to awaken you to something new, fresh, inspiring, exciting…a possibility! And, what is wrong with that? Here is what I see when people talk about their dreams: energy is high, voice is excited, posture is forward and inviting, gestures are animated, breathing is deep and full, eyes are bright – sometimes misty with the passion and there is a clear presence of hope. What could ever cause us to put this delight on hold? What is the voice inside our head chattering about? Is that what is holding us back? Do I really need a reason to entertain this dream-vision I have? Who decides if it is not good enough or if it’s frivolous or wasteful or if I’m too old to be thinking this way? After all … it IS my dream! Now here, as I see it, is the problem with dreams: until I take action and actually DO something, they remain, well, dreams! They get put on hold or forgotten or lost. What if you worked that dream – you put clarity around it – you mapped out a plan of action? What would that be like? And then, what if you had someone to celebrate each small, sweet step you took toward realizing it? How would that be for you? One of the meanings of the word dream is this: A condition or achievement that is longed. So, if it is something that is “longed” – isn’t it about time you began to fulfill that longing with authentic actions? Would you allow me the privilege of helping you become clear on your dreams and, together, create small sweet actions to take you forward? Would that be okay with you?